What's the PTA and How Does it Work? 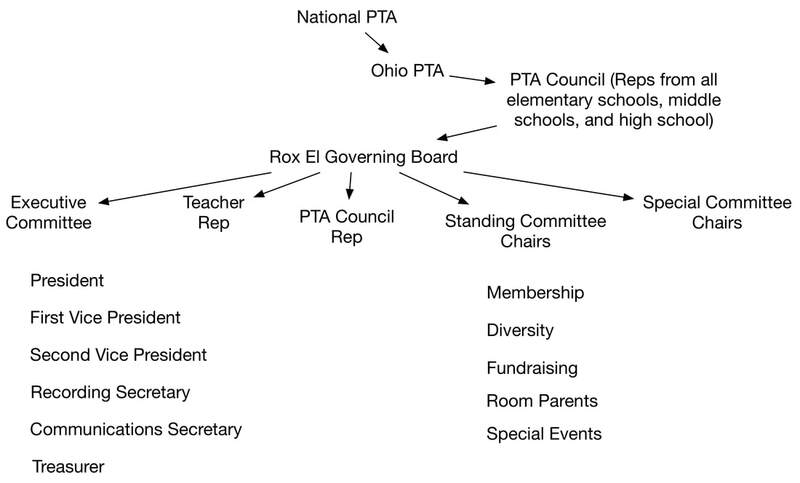 Rox El PTA is a local PTA organized under the authority of Ohio Congress of Parents and Teachers (Ohio PTA), a branch of National Congress of Parents and Teachers (National PTA). The districts also have a PTA Council that offers guidance and assists with initiatives. Members can request a copy of our bylaws and a budget report by emailing roxelpta@gmail.com. Minutes and meeting archives are available on this page. Special Committees are more flexible, created on an "as needed" basis. Generally, every major event (e.g., Multicultural Night), service (e.g., school directory), and effort (e.g., Chocolate Bar Sales) gets a committee chair and members to share the work. To find out more about getting involved in Special Committees, see the volunteer page.